Lower Clapton residents were involved in a public consultation on the future of Chatsworth Road, which took place on four snowy days in February and March. The area has lately been under scrutiny for its rapid regeneration, leading the Chatsworth Road Neighbourhood Forum to call on local people for suggestions and feedback. Held in the nearby Nye Bevan Hall and Chats Palace, the drop-in workshops attracted over 160 residents who wanted to make their voices heard. “We had a really diverse range of people attend, from a huge variety of ages, ethnicities and occupations,” said Euan Mills, Chair of Neighbourhood Forum. 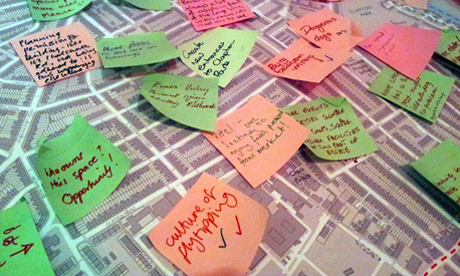 Attendees were invited to add pink and green Post-It notes to maps of Clapton indicating problems and suggestions. The debate was split over five topics: shopping, getting around, jobs, housing, and amenities. While some disagreements were expressed via written notes, the general atmosphere was one of amicable discussion and constructive debate. Some suggestions came up time and time again. Residents agreed that there should be more free cash machines, two-way cycle routes, that the area should be kept free of big chain supermarkets, and that Homerton High Street needs better pedestrian crossings. Most residents supported the suggestion of “no more betting shops”, although others felt these provide “local character”. The area’s gentrification was central to discussions. The comments “Sunday market too expensive for many. This is alienating and dividing the community,” and “rents going up – locals being ‘pushed out’ of here,” were widely supported. The question of pedestrianising Chatsworth Road on market days was hotly debated – most Sunday shoppers were in favour of a no-car zone, but local businesses argued that closing the road would cause them considerable problems. In the amenities section, suggestions included: “Reinstate bandstand on Millfields”, “Too much dog poo” and “More butterflies.” With regard to transport, the Overground is seen as “much improved” but “should operate longer hours”. Many felt that apprenticeship schemes should be encouraged in order to boost local employment skills. The 1000-plus comments will shortly be put on the Neighbourhood Forum website and will form the basis for planning policy in the area supported by the Localism Act of 2011. The next step will be drafting a Neighbourhood Plan, which will be ready from about autumn this year, followed by a local referendum.